Looks like we dodged a bullet. A bullet-shaped asteroid that is. 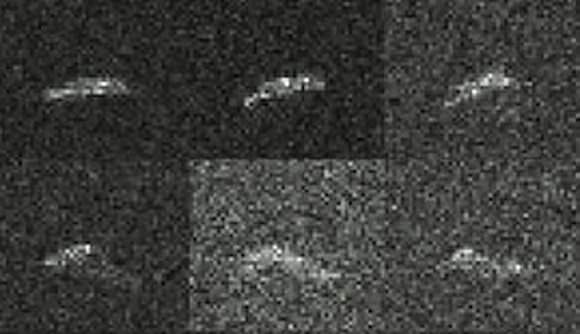 The 70-meter Goldstone radar dish, part of NASA’s Deep Space Network, grabbed a collage of photos of Earth-approaching asteroid 2014 SC324 during its close flyby last Friday October 24. These are the first-ever photos of the space rock which was discovered September 30 this year by the Mt. Lemmon Survey. The level of detail is amazing considering that the object is only about 197 feet (60-meters) across. You can also see how incredibly fast it’s rotating – about 30-45 minutes for a one spin. In the cropped version, the shape is somewhat clearer with the asteroid appearing some four times longer than wide. 2014 SC324 belongs to the Apollo asteroid class, named for 1862 Apollo discovered in 1932 by German astronomer Karl Reinmuth. Apollo asteroids follow orbits that occasionally cross that of Earth’s, making them a potential threat to our planet. The famed February 15, 2013 Chelyabinsk fireball, with an approximate pre-atmospheric entry size of 59 feet (18-m), belonged to the Apollo class. 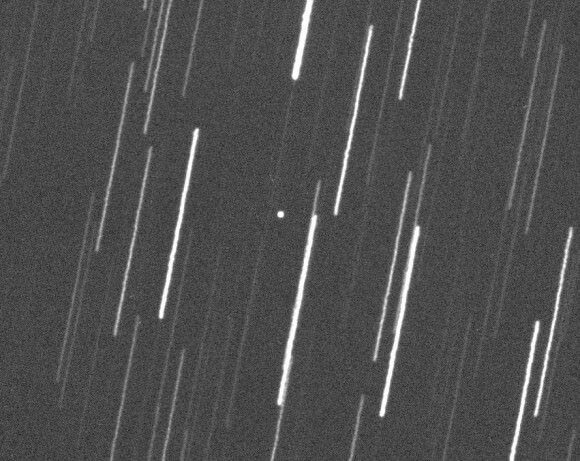 Lance Benner and colleagues at Goldstone also imaged another Apollo asteroid that passed through our neighborhood on October 19 called 2014 SM143. This larger object, estimated at around 650 feet (200-m) across, was discovered with the Pan-STARRS 1 telescope on Mt. Haleakala in Hawaii on September 17. Tell me we’re not some shiny ball on a solar system-sized pool table where the players fortunately miss their shot … most of the time. What a roller coaster week it’s been. If partial eclipses and giant sunspots aren’t your thing, how about a close flyby of an Earth-approaching asteroid? 2014 SC324 was discovered on September 30 this year by the Mt. Lemmon Survey high in the Catalina Mountains north of Tucson, Arizona. Based on brightness, the tumbling rock’s size is estimated at around 197 feet (60-m), on the large side compared to the many small asteroids that whip harmlessly by Earth each year. Closest approach happens around 2 p.m. CDT (7 p.m. UT) Friday afternoon when our fast friend misses Earth by just 351,000 miles (565,000 km) or 1.5 times the distance to the Moon. This is a very safe distance, so we can finish up our lunches without a jot of concern. 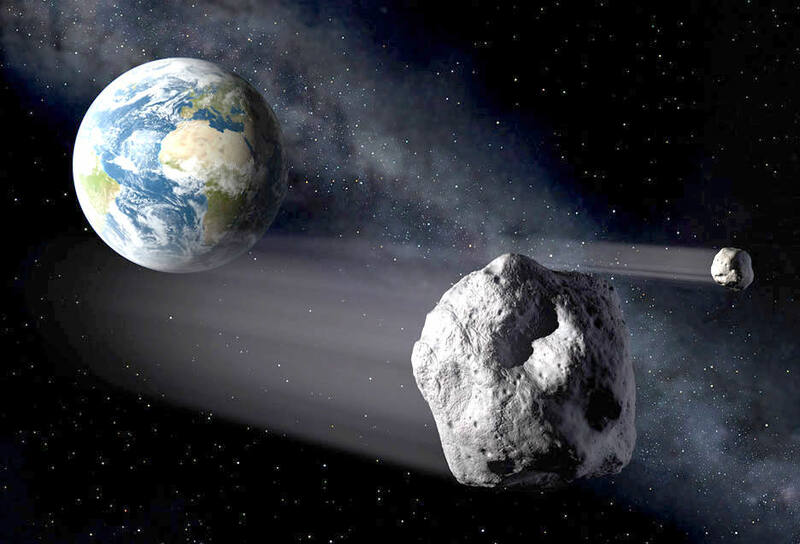 But the asteroid’s combination of size and proximity means amateur astronomers with a 10-inch or larger telescope will be able to track it across the sky beginning tonight (Oct. 23) and continuing through tomorrow night. 2014 SC324 should shine tolerably bright this evening at around magnitude +13.5. Bright here is something of a euphemism, but when it comes to new Earth-approaching asteroids, this is within range of many amateur instruments. And because 2014 SC324 is “only” a half million miles away tonight, it’s not moving so fast that you can’t plot its arc on a single star chart, spot it and go for a ride. By Friday evening, the new visitor will have faded a bit to magnitude +14. You can create a track for 2014 SC324 by inputting its orbital elements into a variety of astro software programs like MegaStar, the Sky, and Le Ciel. Elements are available via the Minor Planet Center and Horizons. Once saved, the program will make a track of the asteroid’s movement at selected time intervals. Print out the chart and you’re ready for the hunt! You can also go to Horizons, ask for a list of positions every 15 minutes for example and then hand plot those positions in right ascension (R.A.) and declination (Dec.) on a star map. This is what I do. I find the the general chunk of sky the asteroid’s passing through, print the map and then mark positions in pencil and connect them all with a line. Now I’ve got a chart I can use at the telescope based on the most current orbit. Tonight the errant mountain will rumble through Aries the Ram, which is conveniently located in the eastern sky below Andromeda and the Great Square of Pegasus at nightfall. Finding a dim, fast-moving object is doubtless an exciting challenge, but if you lack the equipment or the weather doesn’t cooperate, you can see the show online courtesy of Italian astrophysicist Gianluca Masi. He’ll stream the close encounter live on his Virtual Telescope Project website beginning at 7 p.m. CDT (midnight UT) tomorrow night October 24-25.